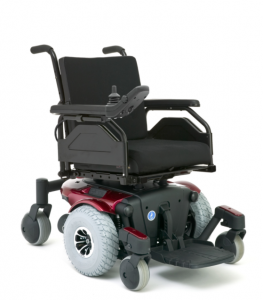 The Quantum 610 from Pride Mobility is a compact Power Chair that achieves excellent stability. The middle wheel provides power directly under the chair’s centre of gravity allowing the other four wheels to stabilise and steer. Thanks to this six wheel design the 610 is highly stable and manoeuvrable in confined spaces. The core unit of the Quantum 610 accepts a wide range of seating and optional additions, making it one of the most customisable and adaptable power chairs on the market. Accessories include a rear basket and leg rests which can be adjusted according to your requirements. The Q610 is made up of two main components; the power base and the seat assembly. The seat assembly usually comprises of the seat base, back and arm rests. The power base consists of two motor/brake units. Two drive wheels along with the four caster wheels. The unit also includes the two batteries and wiring harness. The seats are attached via the Universal Mounting System (UMS) giving the widest range of choices. Once in place the seating can be adjusted for comfort. The seat hight and angle can be changed as well as the foot platform height and controller position. As well as moving the seat up and down it can also be moved forward or backwards to allow for a more natural sitting position. The main power module is connected to the battery and drive sections via a safety circuit breaker. This safety feature protects the unit from excessive load or strain. The two drive wheels can be disengaged from the motor to allow the chair to be manually manoeuvred. We will be happy to advise you about battery usage, but as a rule of thumb you should aim to charge your Power Chair on a daily basis if you use it every day. 8 to 10 hours overnight should keep it topped up and ready to use the next morning. If you use the chair less often you may prefer to charge for 24 hours once a week. The Pride Transit Securement Package has been designed to conform with the ISO 7176–19 standards. This means that when fitted the power chair can be secured in certain types of motor vehicles. Please note that this standard only relates to transporting the chair whilst unoccupied. The Transit Securement Package cannot be retrofitted on existing power chairs as it only available when factory installed. So the Quantum 610 provides comfort and safety whilst allowing for a wide range of choice of accessories and colour. The Mid-Wheel 6® design means that the power chair is stable in most terrains. The drive wheel can be either air inflated or solid depending on the user needs.